The work challenges tenacity, flexibility and versatility of a balloon as a material. 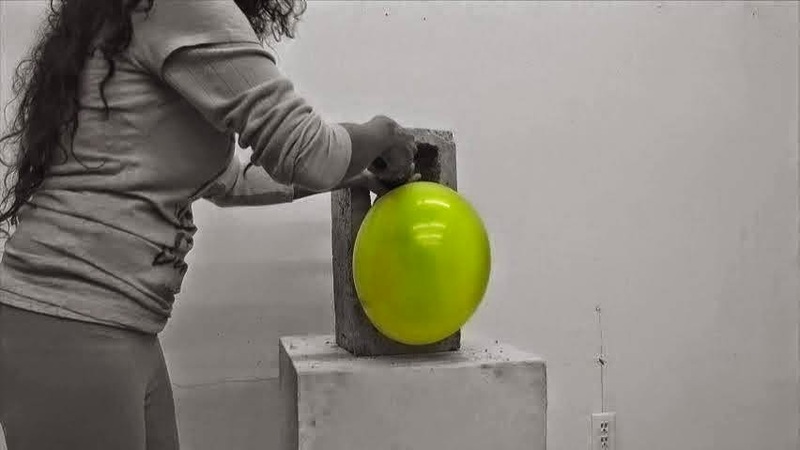 The artist juxtaposes the concrete with a fragile, ephemeral rubber balloon. Vanita Gupta (IN) studied Fine Arts at the L.S. Raheja School of Art, Mumbai. Has devoted her attention to the minimal, most relevant and compelling forms. Known primarily for her signature paintings in black, her work continues to evolve into sculpture and film. Gupta has participated in several group shows and held solo shows at Pundole Art Gallery and Jehangir Art Gallery, Mumbai. Participated in 50 Years of Art in Kala Ghoda Festival at the National Gallery of Modern Art, Mumbai; and in the National Exhibition of the Lalit Kala Akademi Delhi and Ahmedabad.